On November 28th, Intact Media Group’s TV division launched its novel news studios, equipped with the latest technology. As such, Antena 1, Antena Stars, Antena 3, Happy Channel and ZU TV broadcast full HD, from the new sets in Pipera center. November also meant the relaunch of „Observator” ( news bulletin), in a unique, spectacular set in Romania. 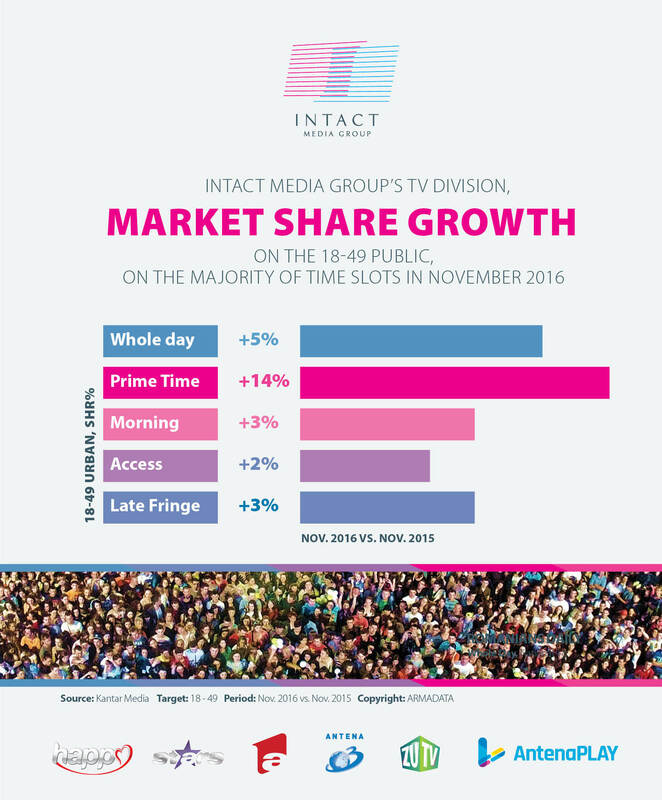 Commercial target: Intact’s channels have market share appreciations on most time slots, amongst which Prime Time (+14%) and Whole Day (+5%). Urban All: the TV division leads most time slots, amongst which Whole Day and Prime Time. Market share appreciation occurs on the majority of time intervals, compared to November 2015. 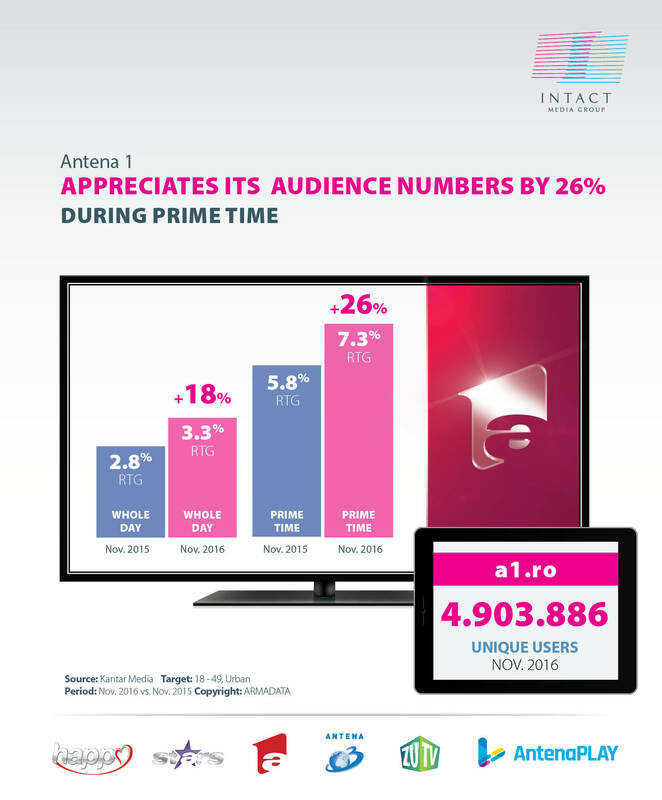 Național: Intact Media Group’s TV stations hold the first position during Whole Day, Prime Time, Day Time, Access and Late Fringe, and show appreciations compared to November 2015 on all time slots, including Whole Day ( +12%) and Prime Time (+17%). Antena 1, the flagship entertainment channel, home to the largest star system in Romania, has spectacular results in November. Market share and audience appreciations take place on most time intervals and all targets (commercial, Urban All and National). Commercial target: the channel audience shows appreciations on most time slots, including Whole Day (+18%) and Prime Time (+26%). The market share is also on an ascending track on all time slots and all targets, including Whole Day (+25%) and Prime Time (+35%). The super productions Chefi la cuțite ( Game of chefs), iUmor (comedy talent show) have 100% market leadership , respectively 75% leadership on their time bands. Poftiți pe la noi (Poftiți la muncă – celebrity reality show), Te cunosc de undeva ( Your face sounds familiar) , X factor and În puii mei (comedy show) were the most watched productions in November. 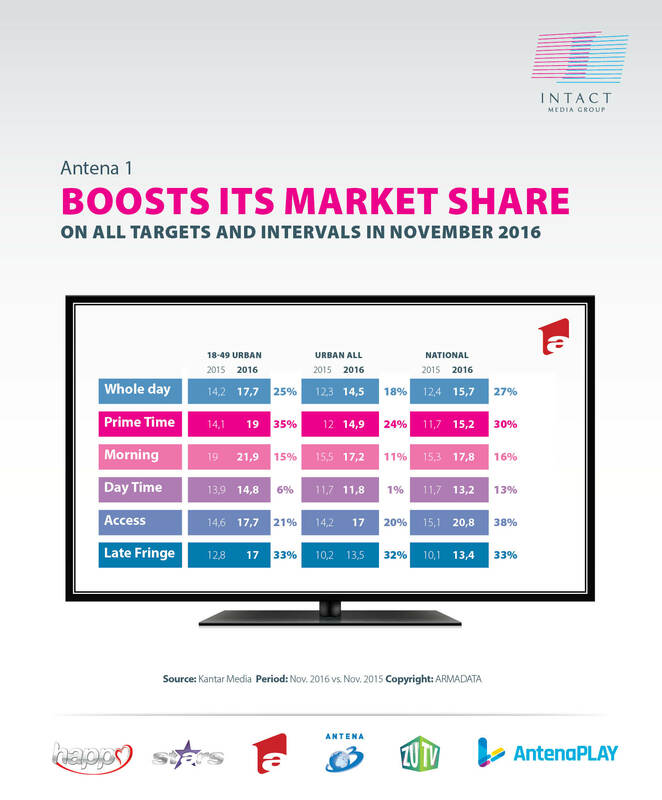 Urban All: Antena 1 is market leader during Access, (when the reality show “Acces direct” and Observator news bulletin are aired) and shows market share appreciation on most time slots, including Whole Day (18%) and Prime Time (24%). National: leads during Access, with market share evolution on all time slots, amongst which Whole Day (27%) and Prime Time (30%). Observator’s relaunch on November 28th, complemented by the HD format, brought spectacular graphic and set elements – a 14.5 m long and over 2.5 m tall screen, as well as the ultimate broadcast technology, at top international standards. Antena 1 was watched in November, during Whole Day, for at least one minute, by 8.4 million Romanian, whilst www.A1.ro had almost 5.6 million unique users. 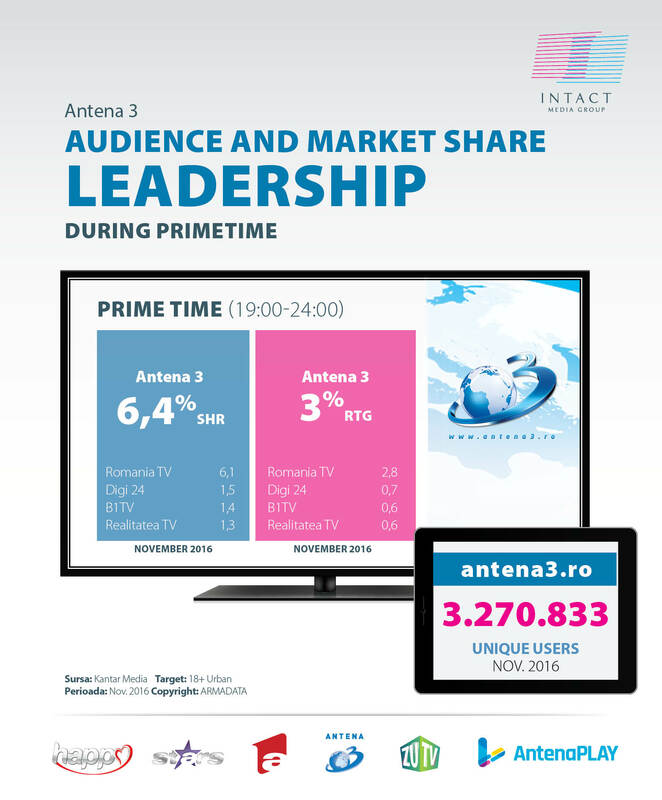 Antena 3 is leader of the news niche in Romania in November on the most important time slots, amongst which Morning and Prime Time. In the first eleven months of 2016, the news channel is leader on most time slots, including Whole Day and Prime Time. “Adevăruri ascunse”, “Punctul de întâlnire”, “Sinteza Zilei”, “În premieră cu Carmen Avram” and “Subiectiv” were amongst the top productions last month. Antena Stars, the only TV channel dedicated to showbiz, was watched in November by more than 3.5 million Romanians, on the national target, during Whole Day, for at least one minute. Antena Stars’ most popular productions last month were “Refresh by Oana Turcu”, “Alege Dragostea” , “VedeTop”, Răi da’ buni” and “Capcana Seducției: Test de Fidelitate”. Happy Channel, the Group’s TV station addressed to women, has significant market share and audience appreciation compared to last year, both in November, but also in the first nine months since its launch. 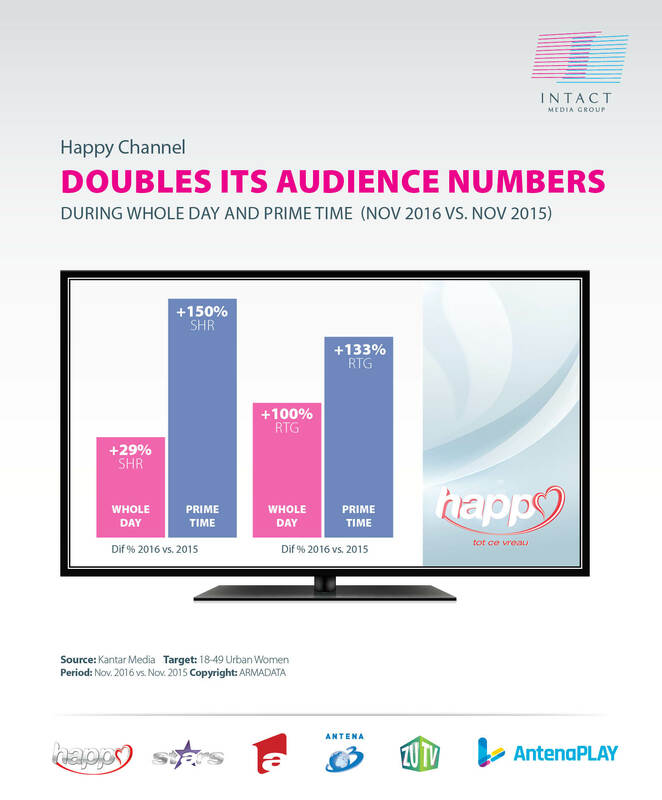 Compared to November 2015, Happy Channel shows audience appreciation on most time intervals, on the commercial target, doubling its audience numbers during Whole Day and Prime Time. In terms of market share, the channel has 150% boost during Prime Time and 29% during Whole Day. The Turkish series Elif, Hart of Dixie “A que no me dejas” and Suits were November’s most watched productions. ZU TV, the channel that addresses the young generation (15 – 34 years old, urban population) has caught the audience’s eye with productions such as Morning ZU, Bobiceag și duba de artiști, Miezu’, Torpedoul lui Morar and Most Wanted. November triggered big numbers for the online division as well. Digital Antena Group occupied two positions in top 10 all Romanian websites (with www.a1.ro and www.spynews.ro). A1.ro is leader of the entertainment category with more than 4.9 million unique users in November and aims to secure a spot in top all websites in .ro. Antena Play, the video on demand platform, received a new identity in November, to mark its constant transformation. Also, starting November, 28th, www.observator.tv was redesigned and will function integrated with the newsroom, so that its readers can receive real time information on all existing digital channels. Almost 10 million Romanians watched Intact’s productions during Whole Day, for at least one minute, on national level, during November 2016 and more than 7.3 million during Prime Time. Intact Media Group thanks its public and partners for all their support and loyalty. Intact offers the ultimate content mix through its multi channel platform, for all age segments and consumer preferences.